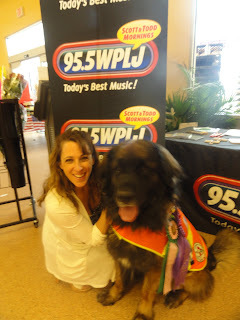 Events & Blog: Chewee meets WPLJ's famous COOPER LAWRENCE!!! On 6/18/11 Chewee met the famous COOPER LAWRENCE from WPLJ Radio 95.5 with Scott and Todd. Chewee was so happy to meet Cooper he wanted to play. WPLJ had a bean bag toss and Chewee wanted to play in the worst way. He was so excited he jumped up on me and kissed me all over my face saying, "thanks for bringing me here mom". Chewee now has a new girl friend he can listen to everyday on the radio. It was a wonderfully exciting day for Chewee and COOPER.